Mount Raung Trekking Tour Package is one of volcano trekking tour to explore the beauty of an active volcano in Java Island, Indonesia. 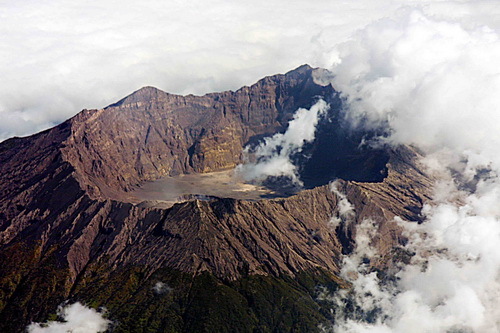 Raung volcano located in Banyuwangi Regency. Mt Raung is settled in Ijen Crater Volcano, The Caldera of Raung volcano ​​has dimensions about 750 m x 2.250 m or 2 kilometres (1.2 miles) wide with an active smokes belching all time and surrounded by a grayish rim. difference color of the rim and flanks of the volcanoes caused by a cracking rim of vegetation compared with the healthy and extensive vegetation on the flanks. "Mount Raung" has elevation at 3,332 metres (10,932 ft) above sea level, its known as tallest volcano of its cluster. Although the valleys between the major volcanoes boast fertile, ash - enriched soil for agriculture, available land is very limited. Mt Raung contains centres constructed along a NE to SW line, with Gunung Suket and Gunung Gadung stratovolcanoes being located to the northeast and west, respectively. Raung Volcano located closed to Ijen Crater that popular has amazing Blue Flame Ijen Crater in the bottom crater, If you have more time on your Journey, You can combine your holiday with Ijen Crater tour package with 5 or 6 days duration. Pondok Motor – summit of Raung 7-9 hours. Start from Bondowoso - Sumberwringin, 1hour. Then report the arrival to Sumberwringin shelter and proceed by taking a ride to starting point of Raung trekking post, Pondok Motor, half hour. From Pondok Motor start hiking to Pondok Sumur, 2 hours. Afterward, there are two posts before the summit and it requires about 4-6 hours to go there. From the last post to the summit, it still needs 1-2 hour climbing. From here we can make a camp and continue in the following morning at 5 am to see the sunrise on the summit. Raung Trekking Package is possible started from Surabaya, Malang, Banyuwangi or Bali Island, for detail itinerary of Mount Raung Trekking Tour in Java, Indonesia, You can read detail itinerary below. Pick up by AC (air conditioned) van from your arrivals at Airport, Hotel, Train Station and take you to your homestay at Sumber Waringin village to stay 1 night. In the morning after breakfast, start trekking to Demit Hut Camp, this route will be across virgin forest in java Island, then stay 1 night by camping. At early morning, continue your trekking to Raung Summit Volcano and explore the Summit and enjoy the Raung Crater which is still active until really finish and satisfied then going up and hike back to village. Overnight in the Homestay in the Sumber Waringi Village. After breakfast, we drive back to Juanda Surabaya airport or your location in East Java Island to catch your flight for your next destination. After you reach your location, finish tour. Trekking tour to Mount Raung have duration for 4 Days and 3 nights. If you need more time to enjoy trekking tour for other volcanoes, you can continue enjoy Mt Semeru Trekking and Mount Bromo Tour package. You can combine other tourism objects in East Java into one private tour package. For detail of trekking tour package option, read detail itinerary below.